Movies shown here were filmed using our X-ray system with attached redlake MotionPro camera or with high speed (MotionPro, Motionscope, Motionmeter) or regular 50 Hz cameras. Most movies were recorded at higher speed and are played back at a slower speed. All movies are reduced in size and image quality to allow for online viewing. All movies are .avi files which are actually best viewed in Quicktime. Just click on the picture to view the movies. The files are rather large so be patient when trying to open them. Adult Chameleo melleri shooting its tongue at a cricket. Small metal markers were inserted into the relevant muscles and bony elements to help quantify the movements. 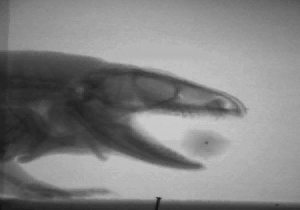 Note the distinct movement of the hyobranchium (tongue skeleton)during projection and retraction. Movie recorded in collaboration with Jay Meyers. This movie was filmed at 500 fps and slowed down considerably (12mb). 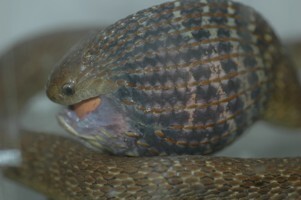 Adult watersnake feeding on a small goldfish. Note how the animal uses unilateral jaw movements to transport the fish through the oral cavity. Once the fish enters the oesophagus cervical bending moves the fish further down the alimentory tract. Movie recorded in collaboration with Shawn Vincent. Filmed at 250 fps but slowed down (6mb). 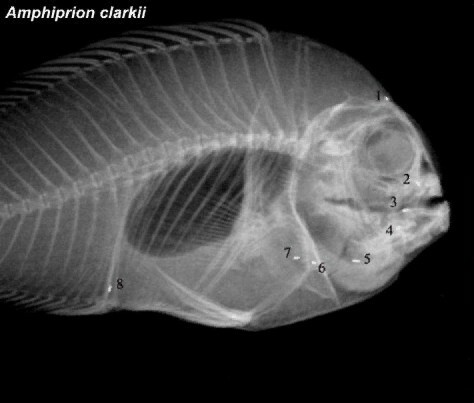 Male Amphipirion clarckii producing sounds generated by the collision of the teeth after rapid release of tension in the sonic ligament. Note how the fish swims with its jaws (red markers) open, depresses the hyoid (blue marker) which releases the tension in the sonic ligament and makes the jaws snap shut. The yellow marker is a neurocranial marker. Movie recorded in collaboration with Orphal Colleye and Eric Parmentier (U. Liege). Filmed at 500 fps but slowed down (6.2mb). Egg eating snake crushing a chicken egg. 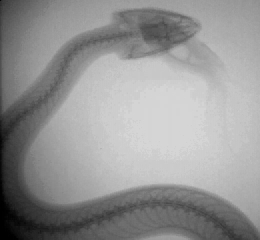 Note how the enlarged ventral projections of the cervical vertebrae (hypapophyses) are used to pierce the egg membrane. The egg shell is typically broken by the time the egg has reached the position of the enlarged hypapophyses. You may have to play teh movie a couple times to get yourself oriented. The movie may play erratically in some players due to its large size. Movie recorded in collaboration with Jonathan Brecko (U. Antwerp). Filmed at 250 fps but slowed down (34mb). 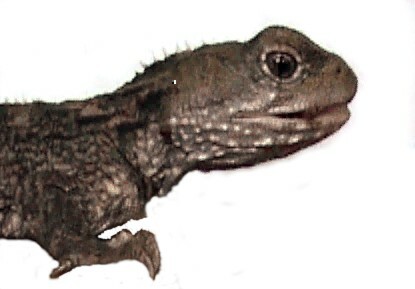 Juvenile tuatara capturing and eating a mealworm. Note how the animal uses its tongue to capture the mealworm. Once in the mouth, watch closely to see the lower jaw slide forward after the jaws have been closed. 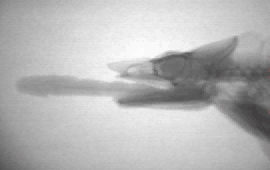 This movement is unique to Sphenodon among lepidosaurs. Movie recorded in collaboration with Vicky Schaerlaeken (U. Antwerp) and Callum Ross (U. Chicago). Filmed at 50 fps (9.2mb). All movies are copyright protected so contact me at anthony.herrel@mnhn.fr if you want to use them.